Could Wozzeck – rather than Carmen or La bohème – be the perfect first-time opera? I was 11. The opera was Elektra. It was an evening that completely changed my life. We all have stories about the first time we went to the opera or the ballet, but few people start their journey with something as ferocious as Elektra. The opening D minor chords pinned me to my seat, blood was spattered all over the walls, and five maids scrubbed furiously to remove the evidence. I couldn’t believe what I was hearing, what I was seeing. I remember some happier music too, sung by Elektra’s sister, and a searing moment when their brother reappeared, long into the nightmare. It made me think: if someone had killed my father, would I be driven to these dark ends? I was gripped. Elektra is a lot to take, even for the most seasoned operagoer. But, for me, it was the ideal introduction to opera, unleashing the full force of the art form with 100 minutes of pure music and drama. But could I honestly encourage others to launch into opera with this staggering piece? Wouldn’t Carmen or La bohème – both masterpieces, both performed this Season at the Royal Opera House – be a better first port of call? The packaging for Carmen and La bohème is instantly more appealing: sun-baked Seville and Paris at Christmastime. And Bizet and Puccini, popping out great tunes at a terrific rate, are decidedly less dissonant than Strauss. Certainly, watching the elated crowd at a schools matinee performance of La bohème in 2012, as part of a project I undertook with conductor Semyon Bychkov, I could grasp the evergreen appeal of Puccini’s 1896 opera. Look beyond the surface, however, and you quickly find that neither Carmen nor La bohème is particularly youth-friendly. One is a tale of revenge, ending with murder. The other is a depiction of the impossible cruelties of love, concluding with the sad demise of its heroine. Ballet has more immediately amenable stories, with The Nutcracker and The Sleeping Beauty chief among them (putting their darker elements aside). But I wonder if we’ve got it wrong when it comes to introducing newcomers to what takes place on stage at the Royal Opera House. What do we hope they will get out of their first experience? Are the goals musical, dramatic or educational? Of course the aim is to enchant and find new enthusiasts, but we should want them to learn lessons from what they see on stage. Maybe, surprisingly, Wozzeck is a more direct way to go. Certainly for Alban Berg, the point of Wozzeck was an ‘appeal to humanity’, as he described the great interlude before the chilling final scene. After the Captain’s baiting, the Doctor’s experiments and all the horrors of Wozzeck’s world, Berg reaches out to the audience with a music passage of indescribable heart. That can speak to younger audiences too. Some might be concerned about exposing young people to violence and the dark world of Berg’s tragedy. But unlike in the television and cinema that is part of their everyday lives, violence is rarely (if ever) glamorized in opera. The kaleidoscopic score of Wozzeck leaves us in no doubt about that. Shedding the pomp and pageantry of opera from previous centuries, Berg’s 20th-century masterpiece really grabs its audience by the scruff of the neck. It doesn’t let go for its short but intense 90 minutes. And with bold characterizations, its mixture of everyday sounds and rich underscore and totally lucid storytelling, Wozzeck really is, alongside my first-time experience of Elektra, one of the most vivid introductions anyone could have, regardless of their age. It might shock, but it’s a risk worth taking for the interest it could easily inspire. Escapism is wonderful: we all need it. But I think you truly open eyes and ears and create enduring fans when they are realize that what is presented on stage is happening in the world around them. With time and experience it’s easier to see through the analogies and parallels of historical settings and traditions. But the earlier that youngsters particularly realize that opera is not about the there and then, it is the here and now, the better. What was your first operatic experience, and what did you think? Do you wish your introduction had been through another piece instead? 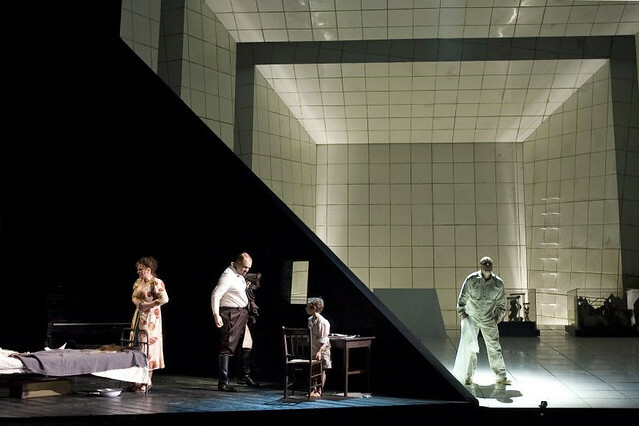 Wozzeck runs from 31 October–15 November 2013. Tickets are still available. hmmmmm...cannot actually comment on my first opera experience as I have not yet had it. Ask me after Nov. 12th.....my first opera will be WOZZECK at the Royal Opera House. I completely agree with this article, the first opera I saw was Salome when I was 16 and I have been hooked on opera ever since!